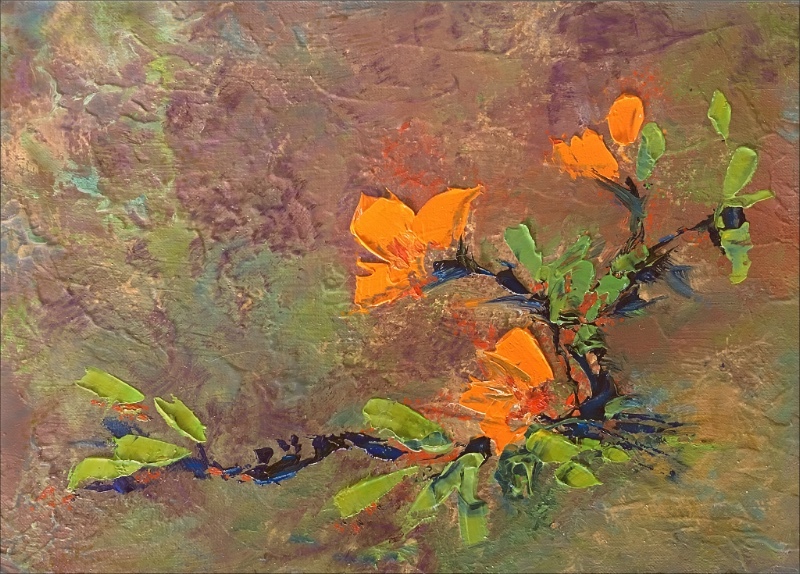 ‘Orange Blossoms’, a textured oil on linen, is my donation to FOLPA’s $50 Friends 5×7 Art Works Sale. Notice it is not signed on the front. We are not allowed. If you are interested in purchasing this piece, be sure to go to Tryst early! Art inspires… It’s for everyone! Spring is always a busy time for the arts. Because one of my goals is to show my work to as many viewers as possible, I have a number of paintings in a variety of exhibits over the next few months. To make it easy, I have given you the basic when’s and where’s with links to each show for the details. April 6-May 26 Tryst Gallery’s Moulin Rouge Exhibition, Opening Reception April 6th, 6-9pm during Leesburg’s First Friday Celebration, 312-F East Market St., Leesburg. Join me there at 6:45. April 13-May 20 Franklin Park Arts Center’s Into the Woods, Opening Reception April 12th, 5:30-7pm, 36441 Blueridge View Ln., Purcellville. April 28-May 13 Clarke County Historical Society’s Spring Art at the Mill, Meet the Artists Reception May 6th, 2-5pm, 15 Tannery Ln., Millwood. April 27 and 28 Friends of Leesburg Public Arts (FOLPA) $50 Friends 5×7 Art Works, Opening Reception at Tryst Gallery Friday, 6-9pm and Saturday, 10am-4pm, 312-F East Market St., Leesburg. June 2 and 3 13th Annual Western Loudoun Artists Studio Tour, Free self guided tour 10am-5pm each day. Over 60 participating artists open their studios to the public. See their creative process in action. My studio will be located at Stop #25, Franklin Park Arts Center, 36441 Blueridge View Ln., Purcellville, along with Penny Hauffe, Karen/Stuart Helble, Karen Coleman, Yousoung Largent. The Healing Power of Art and Artists Anniversary Celebration Exhibition, Click on this link https://www.healing-power-of-art.org/artists-anniversary-celebration-1/. Read about the connection between art and healing. Scroll down, I am approximately the 15th artist in the showcase as they add more art and artists weekly. This is ongoing for the year. Artsy Shark Featured Artist! Artsy Shark features and promotes artists by publishing individual portfolio articles. In May, they will be promoting my work. You will be able to see it here on my site.